Our cottage, Sailor's Rest, sits right on the rocks at the ocean's edge (deep water) with views all around. Watch the active lobstering (almost always a lobster boat in sight), recreational boating, and coastal wildlife including eagles and seals. We are in a wonderful kayaking area! Launching from our yard...please ask about it. We are right between the Portland/Casco Bay area to the south and the Midcoast Maine area just to our north. Our cottage makes a great home-base for your vacation. Comfortable beds and furniture throughout. Bright and sunny, with gorgeous sunrises and lovely sunset glow. The first floor has a fully equipped kitchen with cherry cabinets, a generous sized bathroom with stall shower, a living room (windows on three sides), a dining area, and one bedroom with a queen-size bed. The second floor has two interconnected bedrooms, two twin beds in each. 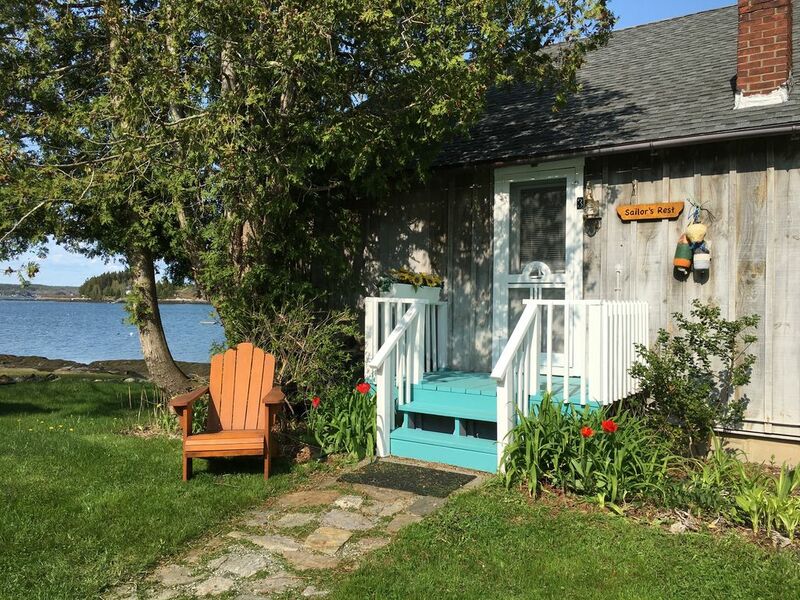 Cundy's Harbor is a quaint, active lobster and fishing harbor that you can drive or walk to. Visit the Holbrook Wharf Restaurant (BYOB) for a summer lunch or dinner, or just ice cream. Visit the cute gift shop and either of the two general stores (Watson's and Holbrook's). We are centrally located for exploring coastal Maine villages. Day-trip options include Camden, Wiscasset, Bath, Boothbay, Portland, Freeport and LL Bean, beaches and parks. Other choices include the Bowdoin College Music Festival, Maine State Theater, many museums, boat rides, antiquing, walking and hiking trails, etc., etc. We have OPTIONAL fees for post-stay cleaning and for use of our sheets and towels if you would rather not bring your own. PLEASE let us know if you want those fees removed and we will adjust the quote. Our Rental Agreement states that we expect visitors to leave the cottage as clean as you found it unless you want to pay the Cleaning Fee. The house/cottage next door has an upstairs and ground floor unit, sleeping two and four... great for a family reunion... privacy for all. See VRBO #24127 and #24126. Note: Saturday is our normal turnover day. We can sometimes accommodate arrivals and departures on other days, but only in the spring or fall. We love to share this wonderful spot with our visitors. Getting the property ready for rental has been a multi-generational undertaking. We are always interested in suggestions on how we can make our visitors' time in Sailor's Rest even better. Watching the weather change and the tides come and go is somehow extremely relaxing. But when you are ready to be a tourist there are endless outing possibilities from a day in Boothbay or Camden to a walk on the rocks. The area has all sorts of peninsulas and villages to explore....all with beautiful settings. Be sure to take drives and discover the beauty of our area. Or explore our islands from your kayak. toilet, shower, Located on first floor. Stall shower only, no tub. Cindy's Harbor - quiet working fishing village. You can't be closer to the water! It's really fun to see the tides come and go. Water is generally calm with minimal small waves even in blustery weather. Blankets & pillows provided. Sheets & towels for a small fee, or bring your own. See the Optional Linens Fee choice within the Quote. Bring your own or pay a small fee to have us provide a set for each person. A few basics like cooking oil, sugar, seasonings, etc. ; starter amounts of paper goods, hand soap. Cleaning supplies provided. Really well equipped including lobster pot, coffee pot, microwave, etc, etc. We have an HDMI cable to allow you to connect your PC to the television. Limited library of older films. Small lawn with seating and picnic table. Cottage was exactly as described, well equipped, extremely clean & a true peaceful spot! Jean was a pleasure to communicate with throughout this transaction. Location was perfect, loons calling, seals swimming, great blue herons, kingfishers, ideal for nature lovers. A working lobster dock was quaint & fun to watch. Nearby shopping & restaurants. Overall perfect Sister's Getaway. Thank you Strock Family! Lovely cottage. Fell in love the moment we walked in the door. Views were beautiful. Beautiful locaton. Well kept comfortable house. Great wildlife siting:seals eagles etc. My Best friend and I drove all the way from Illinois to stay in this beautiful house... we hated having to leave. I have been coming to Maine for 20 years now and I can honestly say...Sailors's Rest has been the best place I have ever stayed in. You can not beat the views. I will rent this home again. Our family loves sharing our special spot right on the water. It can be a crapshoot renting sight-unseen. However, Sailor's Rest was exactly as advertised. It sits right on the water in a very quiet, peaceful environment. The cottage was very clean and well equipped. There is a very useable kitchen, however we did not use it much; just too many good restaurants in the area. Jean was very easy to work with, quickly answering any and all questions. This is a great place to just relax. We had everything we needed. Would recommend to anyone. This is the 9th year that we vacationed in Maine. It has been the best of all. We love Sailor's Rest. You are very special people to have chosen such a magnificent place and then made it so welcoming. Today was a high point as we kayaked out to see the seals. We've never had this opportunity before. The Harpswell area with its granite shoreline and many coves is a natural wonder. The Giant Staircase is a worthwhile side trip. Our favorite restaurant is the Dolphin Marina. Thank you Strocks for allowing us to have this very special time in your lovely cottage. When you have relaxed and enjoyed our views there are lots of day-trip opportunities: Camden, Bath, Wiscasset, Boothbay, Portland, and all of Casco Bay. 25 minutes to L.L. Bean (Freeport). Visit our lovely state parks and beaches (Popham and Reid....well worth the 45 minute ride). Enjoy antiquing, museums, summer fairs, markets and special events including performances at Bowdoin Summer Music Festival and Maine State Theater in Brunswick. A variety of seafood and other restaurants are 5-30 minutes away, many in picturesque locations. Right in Cundy's Harbor you can enjoy our local Holbrook Wharf Restaurant, a gift shop, photography gallery, and two small general stores. From our windows you can watch the lobstermen, the recreational boaters, the birds and Maine ocean life including seals, eagles, osprey and more. Other Activities: Fabulous kayaking (launch from our water's edge), canoeing, boating, nature walks. OPTIONAL linens service and post-stay Cleaning Service are available for a fee. Before finalizing your reservation and payment, please be in touch if you want us to remove either of these fees. Note: Saturday is our normal turnover day. We can accommodate arrivals and departures on other days. Less than full week stays can sometime be arranged depending on availability, particularly own spring and fall.